Arthur Boers is a pastor, seminary professor, author, and Benedictine oblate who has seen his own spiritual journey take a number of turns over the many years of his faithful devotion to Jesus Christ. In his most recent book, Living Into Focus, he writes about how easily we are distracted from what matters most. Arthur emailed me some time ago when the book was being released, and I was pleased to have obtained a copy for review, thanks to David C. Cook Distribution, which oversees Canadian distribution for the publisher, Brazos. I found the book easy to read, well-written, and structured in a helpful way, such that I did not want to put the book down until I had completed reading a chapter. In the Foreword, Eugene Peterson says that the book “is not a book of condescending advice or a blueprint for imposing suggestions or ‘plans’ for a wholesale renovation of a life that is out of control. Rather, it is a personal working through and reflection on the difficulties of swimming against the stream of contemporary culture” (x). This was a helpful prelude to the book, since at times, it did read as if it were just what Peterson describes it not being. Boers helps the reader find the focal points of life and understand what they mean, including various practices that draw us into focus, such as hobbies and even rituals (if we pay attention to them). Recognizing the role that technology plays in contemporary society, he offers some suggestions on how to relate to technology, using the acronym ALERTS: Attention, Limits, Engagement, Relationships, Time, Space. While he admits to using technology himself, Boers writes so glowingly of the Amish that one wonders if he paints a somewhat too radiant picture of older order Mennonite people. That said, we do well to heed the warning that those things which receive much of our focus today – mostly based in technology – are drawing us away from each other. While we are more ‘connected’ than ever, and our world is getting smaller because of communication technology, personal relationships are getting fewer and shallower. Boers offers as alternatives “more fulfilling lifestyles – cooking, offering hospitality, engaging in conversation, exercising, learning arts and crafts” (187). These are decidedly good habits, good foci; yet in our sinfulness, I think even these can be controlling, like technology. I think it was C.S. Lewis, in The Screwtape Letters, who wrote that the best way to discourage a person from the value of walking was to make it into exercise, instead of a journey into the enjoyment of creation. Even good practices can be mis-practised, or overdone. Technology, in that sense, is no different. If we live disciplined spiritual lives, nothing except our desire to glorify and enjoy God forever will be overdone (at least in a perfect world). That said, Boers cites a young acquaintance of his who observed that spiritual disciplines are decidedly not addictive. It is altogether too easy to be addicted to those things which may not, except in moderation, aid our cause of being and making disciples. If we first set our priorities – our key foci in life – then, according to Boers, we can use technology as our servant in making those priorities realities. This book is worth your time to read. It will challenge you, and make you reflect on your life as it is now. We all can stand to experience growth, and this book will help you do just that. 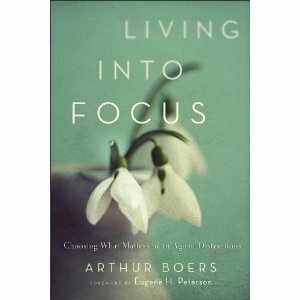 LIVING INTO FOCUS: Choosing What Matters in an Age of Distractions by Arthur Boers, published by Brazos in 2012. ISBN #978-1-58743-314-6.